One garden - four parts. A huge grid of black and white squares now fills the place where the infirmary once stood. 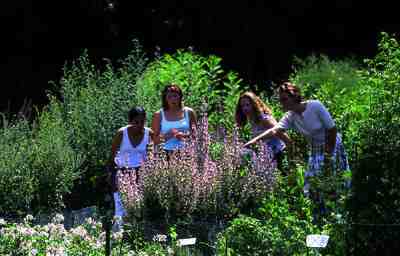 Here medicinal herbs are grown just as they were in the Middle Ages. The chequered pattern is based one that of the earliest monastic gardens such as the one at the abbey of Saint Gall in Switzerland. Each plant occupies its own square of earth with stone slabs around to retain warmth and moisture; a perfectly balanced environment in which the 400 or so medicinal herbs here can flourish. Shade-loving plants in the undergrowth around the old shell-holes. Vauclair - nearly 900 years of history. There is no charge for entry and visitors are welcome from dawn to dusk.